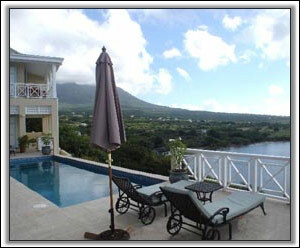 The talk of Nevis - the most magnificent home yet on the island, perched on a cliff overlooking the sea, Cades Bay, and St. Kitts in the most unique area on the island, Cliffdwellers. 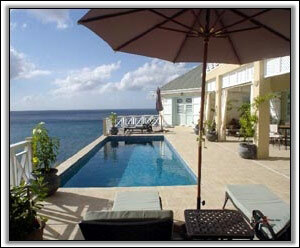 Watch the pelicans dive and the turtles swim from your veranda above the sea. 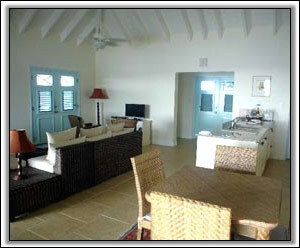 A perfect and economical luxury vacation for four couples, a large family, or extended family. 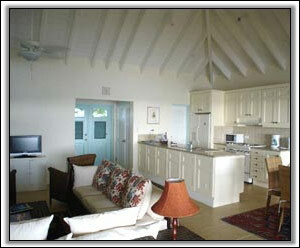 This four-bedroom Nevis home will provide the ultimate in vacation privacy, luxury, and oneness with nature. The open-plan kitchen and living room opens to the incredible views outside through four sets of French doors. The kitchen is equipped with large refrigerator, ice maker, dishwasher, and fully equipped with dishes, glasses, cutlery, and small appliances. 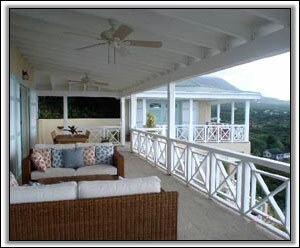 There are dining areas inside the house and on the veranda. The entertainment center offers cable TV, DVD, CD, and wireless Internet throughout the house.. The huge wraparound decks on upper and lower levels afford all guests complete privacy and places to get away from it all. 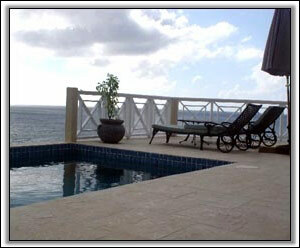 The pool deck is furnished with comfortable sofas and chairs, and lounge chairs and umbrellas. Near the pool is a small bar/kitchenette for snacks and drinks. There is also a gas BBQ on the veranda. Each of the four ensuite bedrooms - all private with their own outside entrance - is spacious with large closets and beautifully appointed bathrooms. Each bedroom has king beds that can be converted into twins. 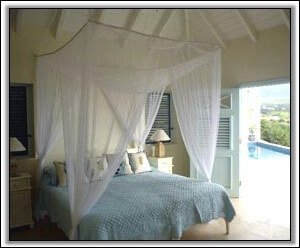 The bedrooms are air-conditioned with remote controls, or can be cooled by the breezes and ceiling fans. Aside from the comfortable furnishings, this house has one of the most spectacular sites on the island, a cliff side location second to none. Cliffdwellers is within 5 minutes of 5 restaurants , a new delicatessen, water sports, and the island's best snorkeling right on the property around the Cliffdwellers coastline. 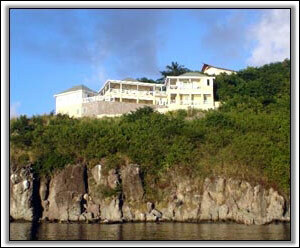 The views of the sea, St. Kitts, the coastline of Nevis and Nevis Peak are spectacular.